Teaching my middle child the realities of firearms. The thing I hear most frequently when talking with people who are unfamiliar with weapons is this: “Ooooooo, I just don’t think I could feel safe keeping a gun in my house with my children.” Now, I’m willing to overlook the hopefully unintended tone of condescension that comes with that statement (as they obviously know I DO keep guns in my house with my three children), but what really gets to me is the fundamentally flawed and illogical line of thinking. As a gun-owning father, I always wanted my kids to have a healthy respect for firearms, and to have the knowledge to remain safe around them. I didn’t want them to have outright fear of the inanimate object itself, but I also wanted them to be fully aware of their destructive potential. It became clear when my oldest was about four that he was lacking in the latter part of that equation. Like any red-blooded American boy, he was a big fan of Nerf guns (all weapons, really). He was also well-aware that I carried a gun, and my wife and I had even drilled him on what his response should be if he ever saw “Daddy” draw his gun when we were out in public. (In case you’re wondering, he was to get low and hide) When trying to explain these realities to a four-year-old, I found myself forced into the overly simplistic language of “good guys” and “bad guys.” Unfortunately, in the imaginative mind of an active boy, some of his duties are to stop bad guys. So, my boy began working up these elaborate scenarios about how if we were ever at the store and there was a bad guy, he could use his Nerf gun to stop them. After we explained that he WOULD NOT be doing that, he would look for other loopholes. What if Daddy ran out of bullets? What if Daddy took the first couple shots and then he could come in and help? (To this day, this kid does not take “no” for an answer very easily.) My wife and I realized that, despite our repeated explanations of the difference in power between my pistol and his single-shot Nerf gun, it simply wasn’t connecting with his little boy brain. And that’s when I came up with what I determined to be the best possible solution – the boy had to see a demonstration of the power-difference between the two guns. My wife and I took a Saturday morning to head out to one of my favorite shooting spots with the boy, loaded up with my gun, his gun, and a small watermelon. After setting up the range area, we spent a little time with the melon. As morbid as this may sound, we pointed out the similarity in shape and density to that of a human head. Then, it was hypothesis time. “Hendric, what do you think will happen if you shoot this melon with your gun?” He’s a smart kid, he’s shot me with that gun before, and he said it would just bounce off. So, we had him set up and take a couple shots. Sure enough, the melon remained perfectly unharmed. He’s lining up his test shot…it’s not gonna go well. Then, it was my turn. “Hendric, what do you think will happen when I shoot the melon with my gun?” He gave this one a little thought, and guessed that it would probably go into the melon. I’m betting his four-year-old brain probably imagined it would make a little hole, and the bullet might even be stuck inside the fruit. We put ear protection on everybody, and then I set up and took one simple shot at the melon. As the shot rang out and bits of melon flew everywhere, the look on his face said it all. That kid was not at all prepared for the sheer level of destruction a 9mm round could bring to a watermelon (which, as we established earlier, was pretty similar to the human head). He was not traumatized, there were no tears shed…he could just finally see what we had been trying to tell him about how these two weapons were VERY different. He never again suggested that he and his Nerf gun would play any role in our family’s self-defense strategy. 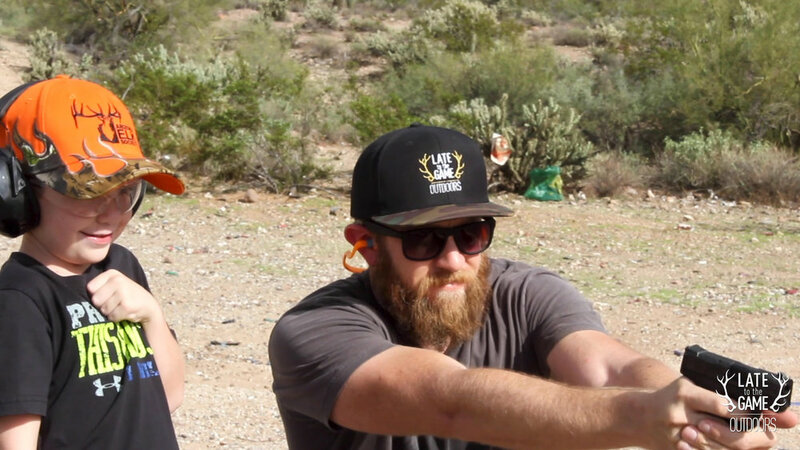 9mm vs. Watermelon…it never stood a chance. Obviously, this is not the only conversation or lesson he (or any of our kids) have had about guns. All of them can recite the four things you do if you ever see a gun or a friend tries to show you one: Stop, Don’t Touch, Leave the Room, Tell an Adult. My kids will also tell you that, unless there is an active and consensual Nerf battle taking place, the Four Laws of Firearm Safety are strictly enforced for all toy weapons. Yes, it’s annoying to constantly remind your kid to watch their muzzle or keep their finger off the trigger for a perfectly harmless toy, but there are few levels of satisfaction that compare to watching a five-year-old walk around with a neon-colored Nerf weapon with the muzzle pointed down and his finger running safely down the side. Some may argue that I’ve made too big of a deal about this whole thing, or that my kids are too knowledgeable about firearms at a young age. Wouldn’t it be easier (some might say better) to simply make sure all weapons are always in a safe and the kids don’t even know they’re in the house? That may work…when the kids are home. (And for the record, every weapon in my house IS in a safe.) But, no matter how careful we are with who our kids hang out with and which houses we allow them to play at, we cannot be with them at all times. I want my kids to make rational decisions based on prior knowledge if they ever encounter a weapon. I still remember the kid down the street when I was about six pointing out his dad’s pistol in the closet, which – to the best of my recollection – was stuffed into a giant stack of papers on the shelf that was well within our reach. I grew up in a gun-free house, and would have had no idea what to do if little Scott had decided we should investigate further. Young kids are hard-wired to be discovering things all the time – they are naturally inquisitive because that’s how they are designed. If something is shrouded in mystery, they can’t help but be curious about it. If guns are never spoken of, never seen, and never clearly taught about, kids will be naturally and innocently curious if they ever encounter the opportunity to investigate one. Sadly, this is where the all-too-frequent and incredibly tragic news stories of horrific gun accidents among small children come from. The moment the bullet impacted the watermelon…that startled look on his face is exactly what I was hoping for! Listen, I am an extremely careful gun-owner, and my kids are never in a position to “happen upon” a loose firearm in my house. Even if they went actively searching for one, they would have zero access to a deadly weapon. But, I wanted my kids to be aware of and even comfortable around guns so that their curiosity wouldn’t get the better of them if something ever were to happen. I have taken both my boys through the “melon drill” at the range, and my daughter is just now getting old enough for her turn. I regularly drill them on the four things they should do if they ever find a gun, and we talk through different scenarios to make sure they know exactly what to do if a risky situation ever arose. So, does it work? I believe I can confidently say yes! First of all, it cured my oldest of his desire to go toe-to-toe with a real life “bad guy” armed with a Nerf gun. But more than that, I look back on one crowning moment I witnessed just about a year ago with my oldest. We had been out running errands as a family, and were all piling out of the car and walking to the front door (you know, that process that should take seven seconds and with small children somehow takes nine years?) Unbeknownst to me, our friends and neighbors across the street had been cleaning out their garage, and had come across a couple of old hunting items and a worn-out old BB Gun. Thinking I might have a use for the items, they set them on our front porch as a gift. As the kids started towards the front door, they all noticed these strange things that were not on the porch when we left. And as they got closer, I heard my oldest say, “Guys, I think that’s a…IT’S A GUN! GUYS, GET BACK! GET BACK!! !” I looked up to see my oldest, arms spread, boxing out both his brother and sister from the porch like he was trying out for the NBA. I rushed up to investigate, and upon seeing the faded Red Ryder, began simultaneously laughing and praising my son for doing EXACTLY what he had been trained to do. Here’s the point: if we are going to be outdoorsmen, if we are going to take protecting our families seriously, then guns are going to be involved in some way. We can (and should) take every safety precaution available to prevent our kids from accessing them. However, I firmly believe that sheltering your kids from the mere existence of firearms does them a disservice, and actually leaves them less safe and certainly less prepared. So, if you want to teach your kids about the seriousness of firearms in a way that will actually get through to them and help them form a realistic understanding of their power, head out and run the “melon drill.” It will be a powerful visual they won’t forget, and provides a basis for continued conversations moving forward. If you want to see the “melon drill” and the instruction that accompanies it, watch the video below.